Four BVI basketball players—Mahkayla Pickering, Omar Walker, Demoi Bradley and Shauliqua Fahie—returned from a five day NBA Authentic Experience in New York, after joining their regional counterparts from Antigua and Barbuda Barbados, Bermuda, Trinidad and Tobago and Turks and Caicos Islands, as the top players advancing from the Digicel NBA Elite Camp held here, October 7-9. The players got to see reigning NBA champions Cavaliers vs New York Knicks game, toured the NBA office and met NBA Legends, Corey Maggette, Allison Feaster, Drew Gooden, Stacey Lovelace, Brian Cardinal and Troy Murphy. They also visited an NBA store, toured the city, participated in scrimmages and played in a game against Rutgers Prep. Fahie expressed similar sentiments. “It’s an experience I’ll never forget,” she said. The scrimmage game against Rutgers Prep was enlightening for the players. Fahie said it was a good game. “My shots were dropping and I like how I played,” she said. While she enjoyed the game, Pickering she thought the team played well and had good chemistry for a team playing together for the first time. “I really liked the competition,” she said. Between their departure and return, coach Jason Edwin said he could see how each of the players matured, by the specific questions they asked the professional and he thinks it cemented their idea of what it will take to get to the next level. 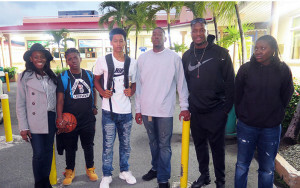 Katasha Melville, a Digicel marketing and sponsorship executive, said it was not only about basketball but, experiencing the USA culture and she liked that the players had the opportunity to speak with NBA legends.